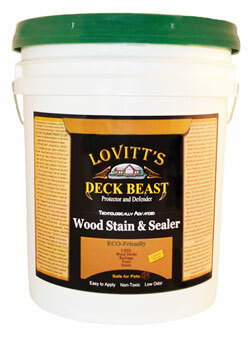 Lovitt's Deck Beast is the latest in deck coatings technology! Deck Beast contains micro-acrylic resins and natural oils combined with state of the art (HD) tinting system for eye popping tones that highlights the natural beauty of the wood grain, knots and character of wood. This product is easy to apply, has low odor, VOC compliant in all 50 states, and packs a defensive punch against the assault of mother nature! Beautiful translucent finish that highlights wood grain. Designed for tough environments including high altitude and waterfront locations. Easy application, water cleanup, and easy to maintain once applied. Sustainable & environmentally safe, VOC compliant in all 50 states. Hard-drying, deep penetrating formula does not attract dirt, dust, or pollen which can contribute to mildew formation. Uniquely durable, non flammable and tough against wear. Does not have to be removed prior to maintenance coat-REAPPLY as needed. This stain is just to easy to use. All my customers just Love it. And it will outlast all other stains no dark spots when it's time for recoat like sikkens or sashco. I can't say enough about how easy this product is to use and the end result are vantastic!! My deck looks better than it did when it was brand new I can't believe it!